desserts are an essential part of any party menu this time year. on one of America’s quintessential desserts – Pies! This Pie and Ice Cream Bar serves up some of our favorite old school varieties, à la mode. Flaky crust and warm fruit paired with creamy cold ice cream are comforting crowd pleasers. 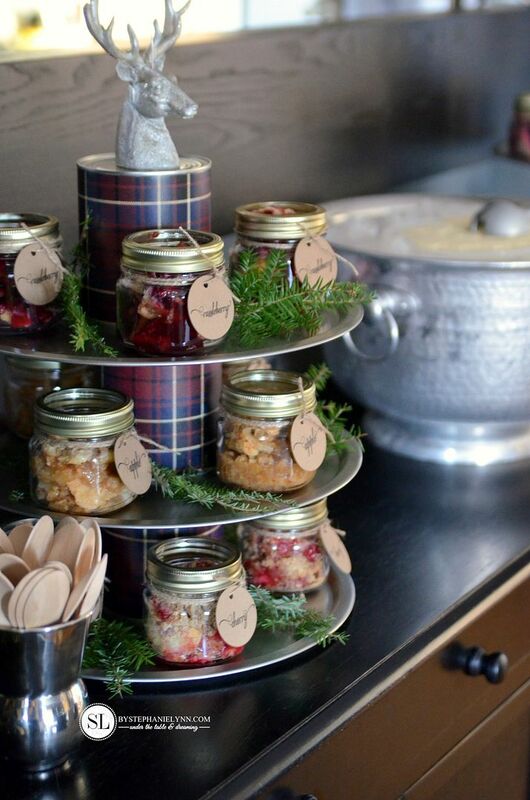 Not to mention the cuteness level of any dessert packed in a mason jar. 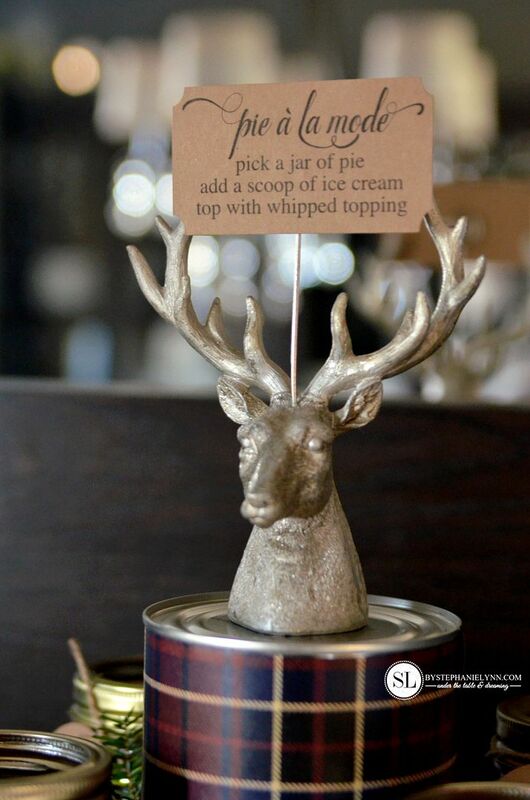 Pie and Ice Cream Bar party plan below. 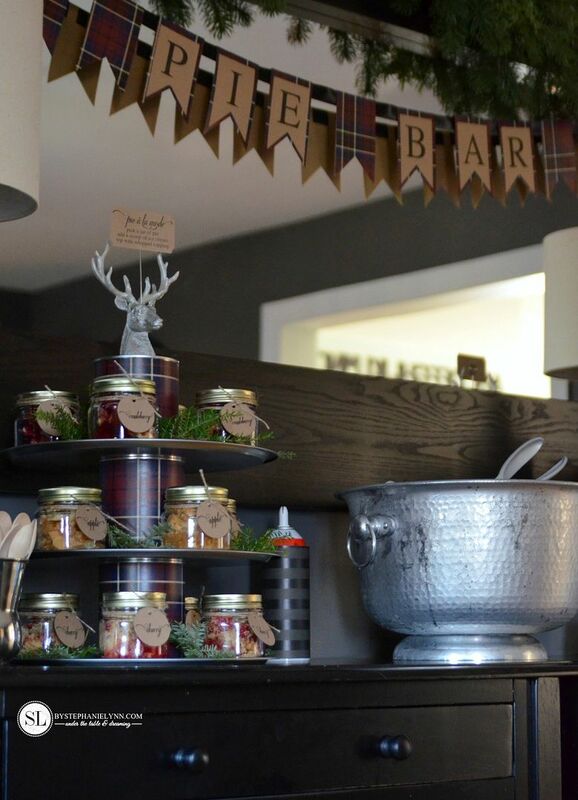 to help you create your own Pie Bar this season. 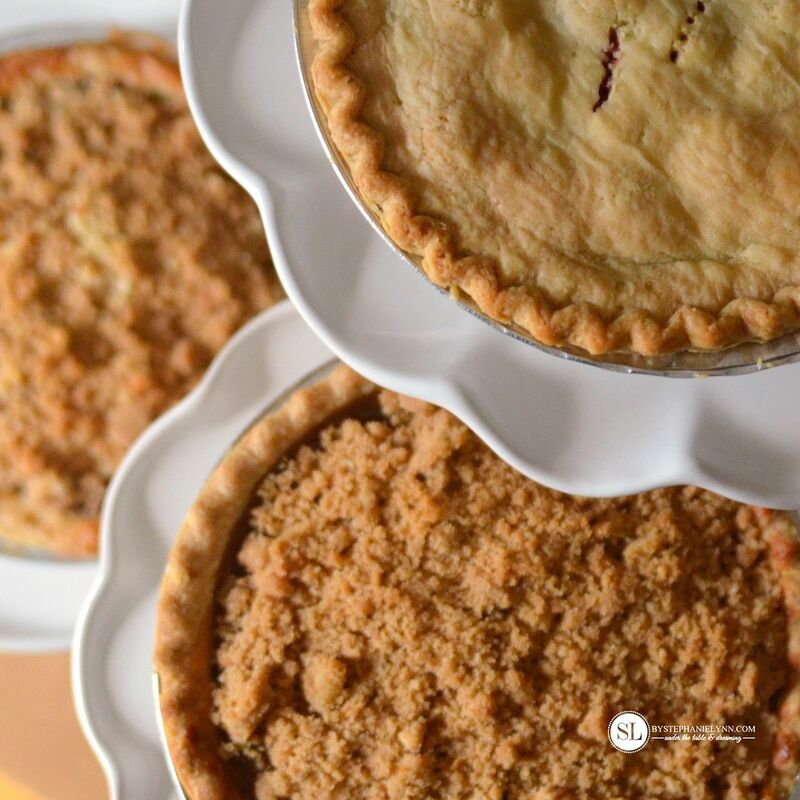 Don’t worry about spending the day in the kitchen for this dessert bar – Marie Callender’s® Dessert Pies have some great options for preparing all of those pies in a flash! Our bar included Razzleberry, Dutch Apple and Cherry Crunch. 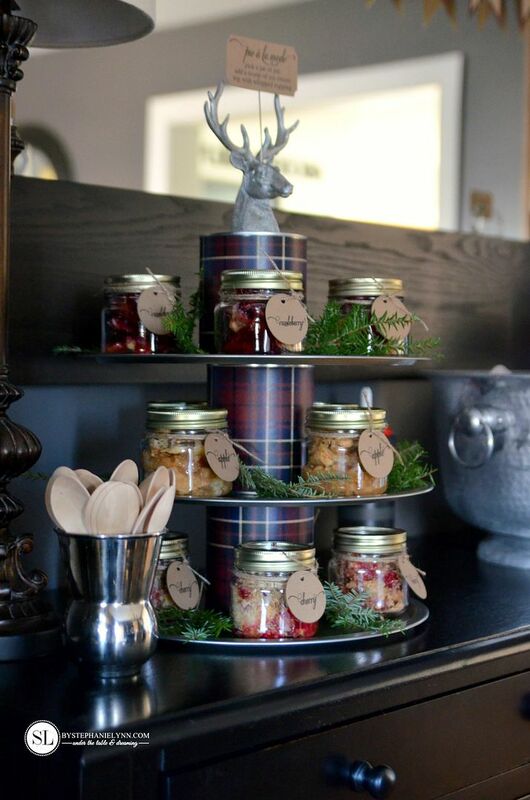 The deconstructed pies were placed in single serve half pint mason jars. 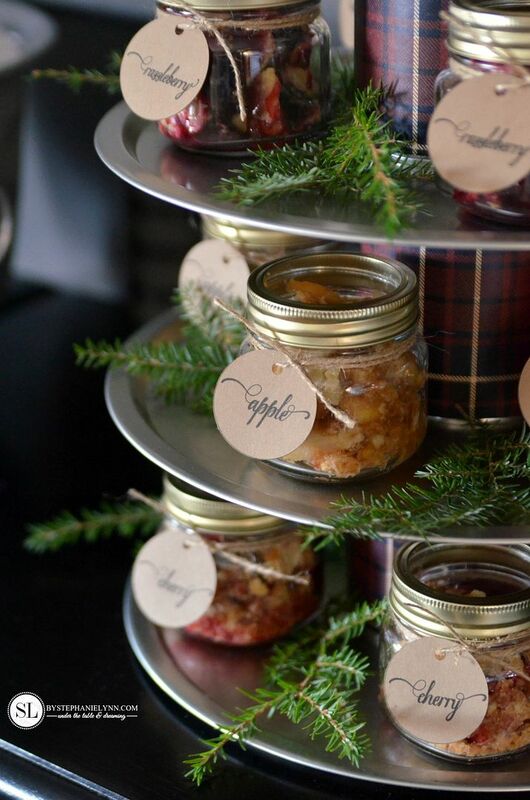 Each jar adorned a kraft paper pie label to differentiate the flavors. If you do not have a variety of dessert stands or cake plates, it is incredibly easy to make your own. 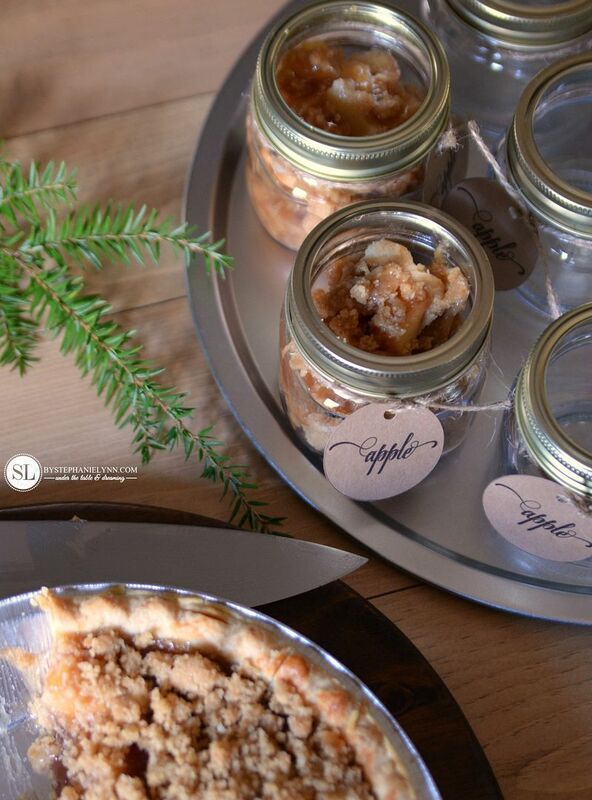 The dessert stands used for this Pie Bar were created with inexpensive pizza pans and large can goods! I love the fact that the stands are sized perfectly for the half pint mason jars. Plus they add some height and interest to the display. 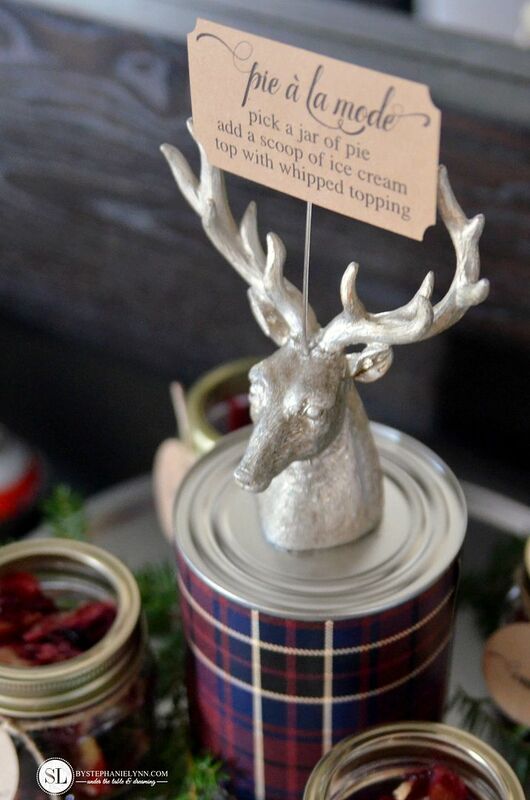 A place-card holder was add to the top can to hold the Pie and Ice Cream Bar details. 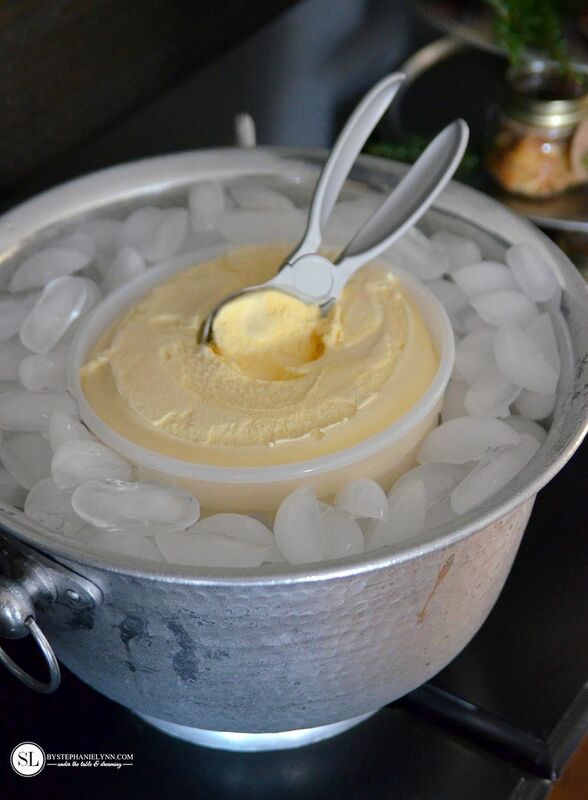 Over the years we have found the best way to serve ice cream is in an ice bucket. right before it is served. as the guests serve themselves. Don’t forget the Reddi-Wip®. 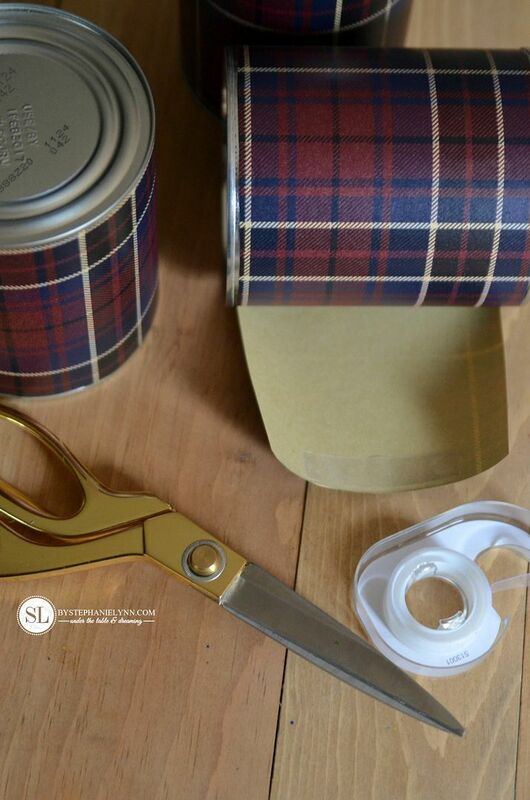 To add a decorative touch, a piece of coordinating scrapbook paper was wrapped and taped to the can. 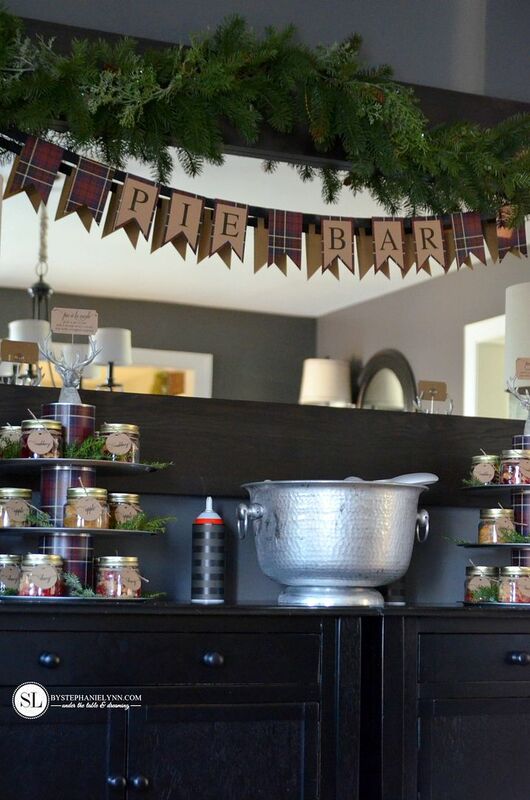 To coordinate with the simplistic decor, a festive Pie Bar banner was hung above the buffet. 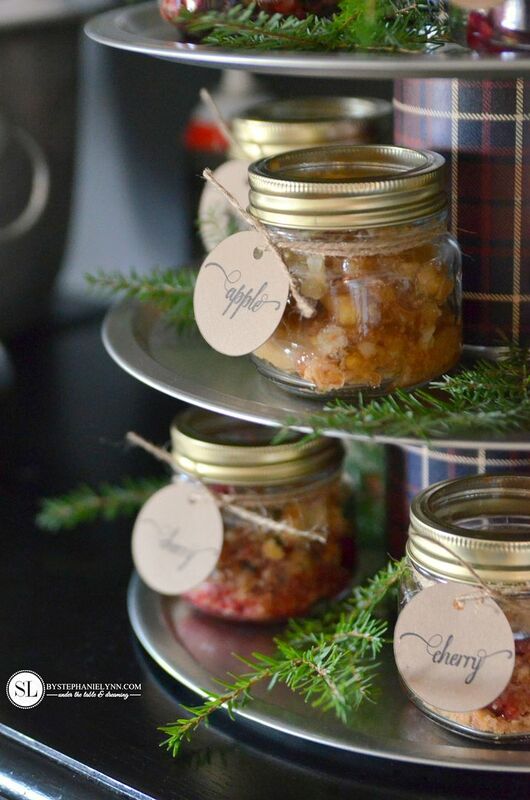 Putting together the pie à la mode mason jars could not be any easier. All of the details can be found below, along with our favorite pre-baked strudel topping recipe. 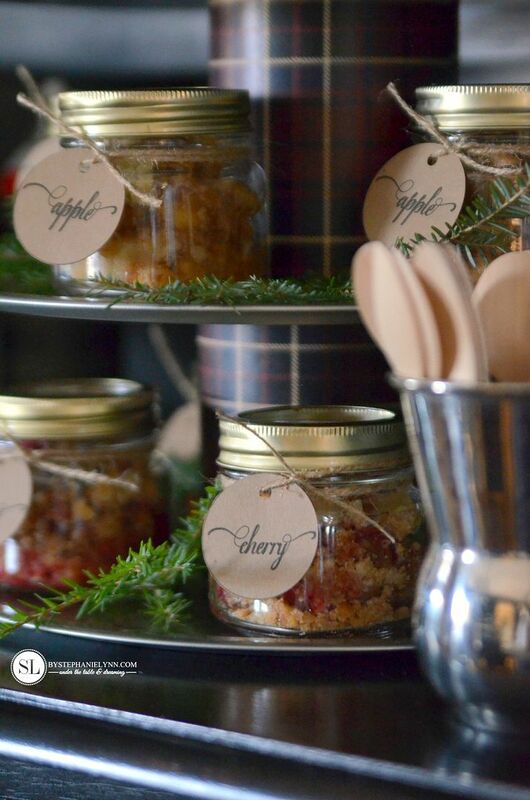 We love to add some extra strudel topping to each jar! In a medium bowl combine the brown sugar and flour. Add in the butter and mix with a fork until crumbs begin to form. 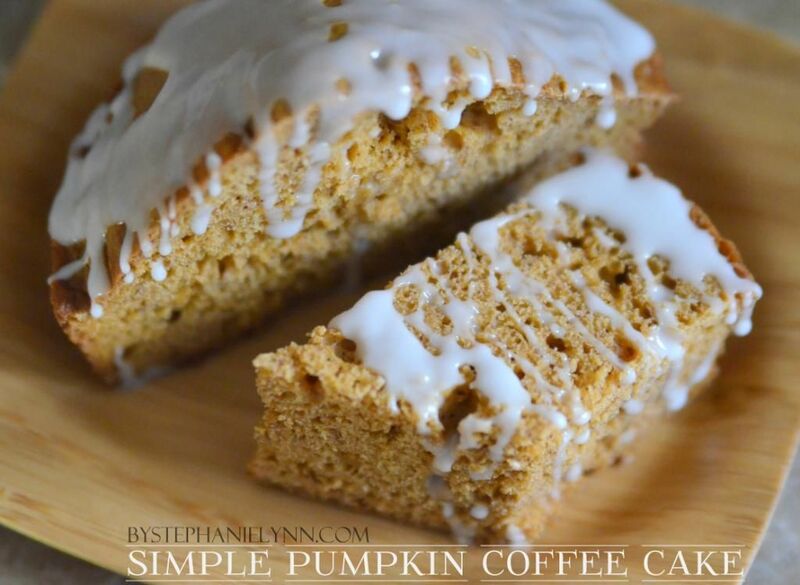 Spread the topping evenly on a baking sheet lined with parchment paper. Allow the topping to cool, crumbling any large pieces. 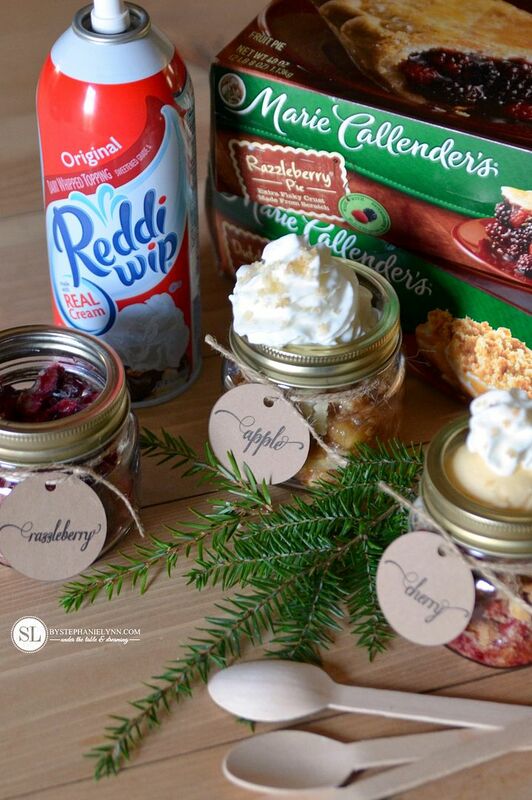 Bake the Marie Callender’s® Dessert Pies as directed on the packaging. Generally, one large dessert fruit pie will fill approximately eight half pint (8oz.) mason jars. The pies that come with the strudel topping, like the Cherry Crunch and Dutch Apple, will fill seven half pint mason jars. If adding additional strudel topping, prepare and bake separately, following the recipe above. Once the pie has cooled, as directed, cut and spoon into the mason jars, adding in random spoonfuls of the pre-baked strudel topping, if desired. 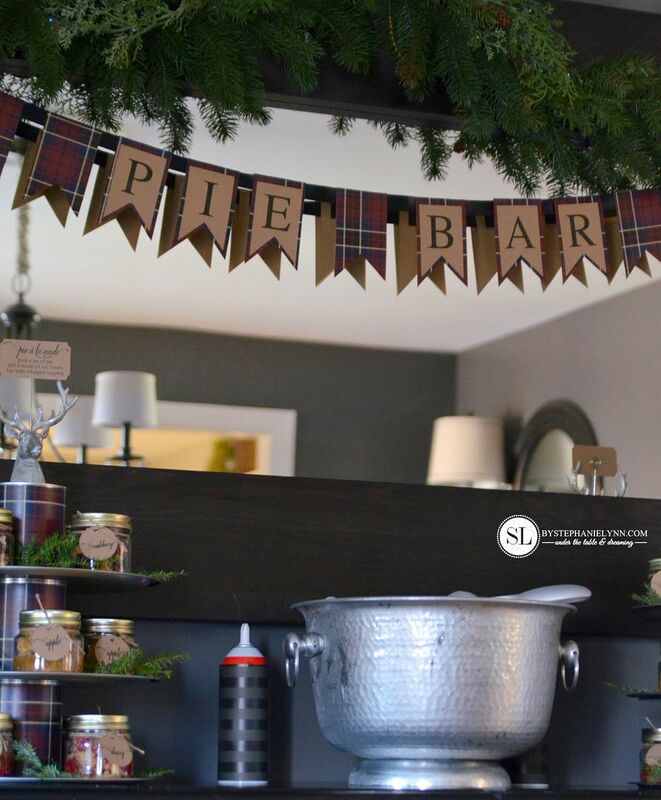 The pie bar banner is created using the two templates above. 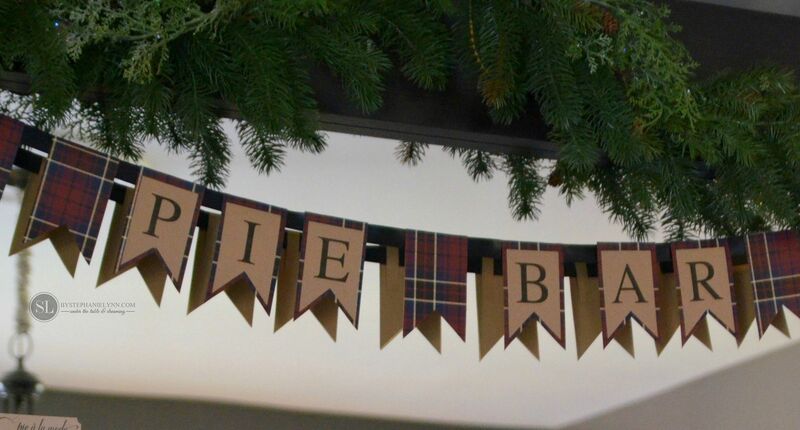 The ‘PIE BAR’ letters are made to fit inside the larger bunting. It’s shown above printed on plain kraft paper cardstock. There are a few ways to design the larger bunting. The template can be traced on a variety of decorative papers or simply printed directly on cardstock. For the banner above, the template was printed on plain kraft paper cardstock. One copy of the template was traced onto plaid wrapping paper, cut out, then attached to the cardstock – using a glue stick. The PIE BAR letters were than attached to the front, using a glue stick as well. The banner is assembled by folding the tabs over a piece of twine or ribbon, and securing the ends with a touch of hot glue. Once the pie labels are printed, a 1.75-Inch circle punch can be used to punch them out – or they can be cut by hand. Using a standard hole puncher, punch a hole near the top. Twine or ribbon can then be used to tie the labels in place. For added stability, leave the cans full and unopened, if possible. Simply wrap each can with a piece of paper – using a piece of double sided tape to secure the paper in place. 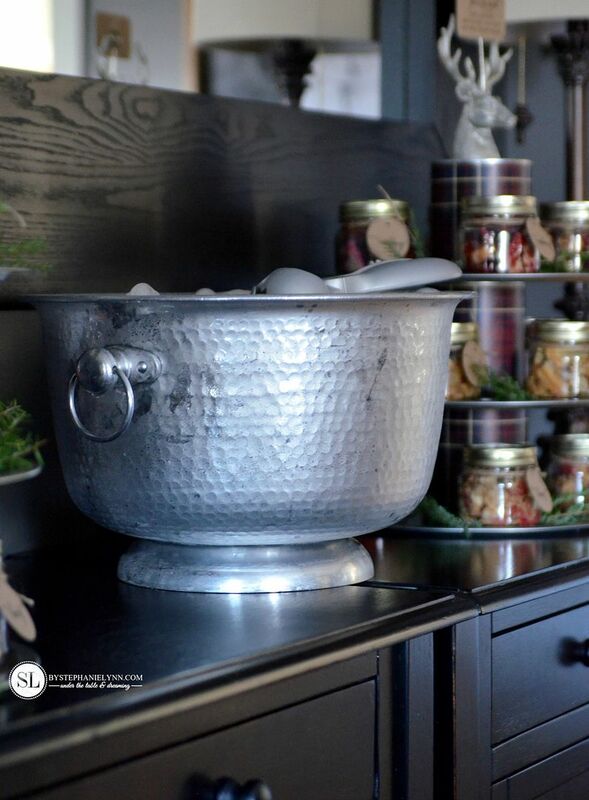 Center the cans on the pans and secure with hot glue. When you are ready to disassemble, the hot glue can easily be scraped off. All of the items included in this Pie and Ice Cream Bar were conveniently picked up at our local Walmart. Bring a sense of ease to your holiday entertaining this year with one stop shopping combined with an array of dessert options from Marie Callender’s. For more inspiration and product information, check out Marie Callender’s and ConAgra Foods on instagram, pinterest, and facebook. How will you #ShareTheJoyOfPie this season? 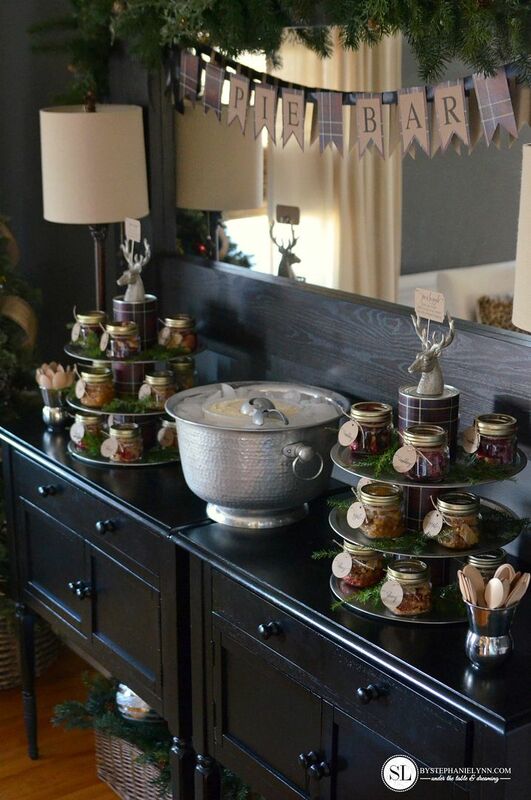 Awesome idea for a bridal shower dessert bar! Your posts have a style and feel that is very pleasing. Everything here is always easy going and elegant. You are a huge inspiration and this Pie Bar is amazing! This is a wonderful idea and looks terrific. Thanks so much for this great idea. I LOVE this! My husband and I just bought a new home, and I have been dreading the idea of the mundane house warming party… But not anymore! What’s more warming than the smell of fresh baked pie and yummy ice cream?! You are a lifesaver! Thank you for sharing the Mason pie recipe. Can’t wait to try it. Such a lovely and fresh idea! Love it. What a wonderful idea & presentation! I can not wait to try this for many different occasions! I also love the idea of using pizza pans in place of cake stands. Again, this method can be used for so many different parties. What size are your pizza trays? I’d like to order some and love the way yours look. Thank you Julie! 12 inch pizza pans were used for the stands. Love everything from how simple it looks to put together to the final display looking so elegant. 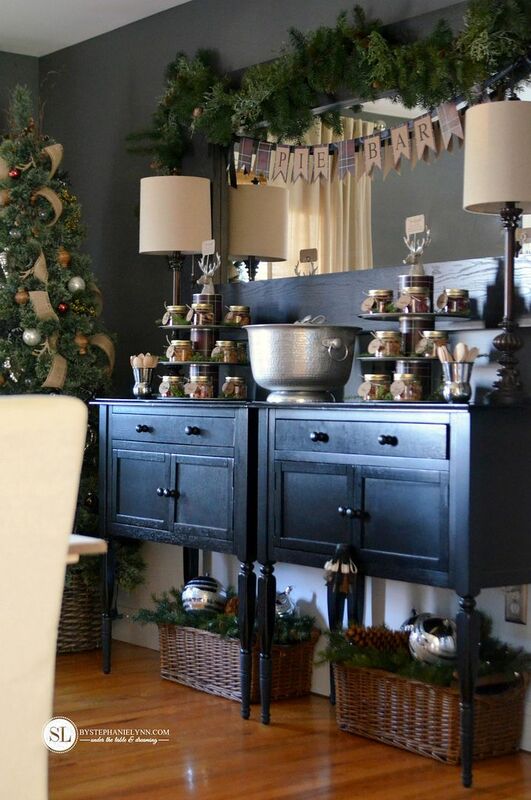 Love anything to do with mason jars. I love your site. I’m using your pie bar and mimosa bar ideas for parties in Annapolis at the end of this month to celebrate our son’s graduation from the USNaval Academy. I am collecting everything in Nashville (home) in advance as to not have too much to do there. The only thing missing are the cute wooden spoons. Not absolutely necessary but very cute. Where did you find them. I can’t wait to use even more of your brilliant ideas.